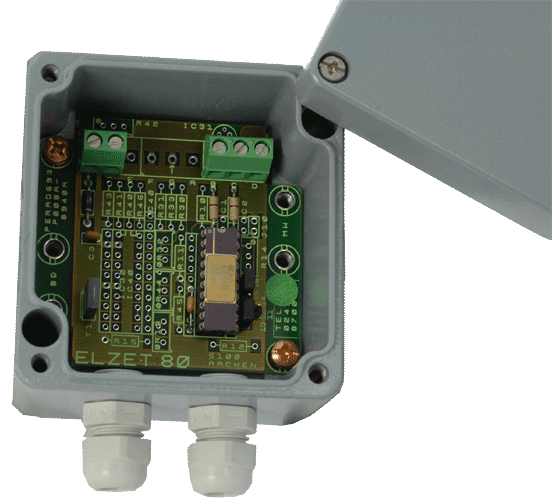 Sensor conditioning unit in 8 by 8 cm (3 1/6" sq) aluminium die cast box (IP65) for use close to the sensor. Sensor signal gets converted to 4..20mA process current for long line drive. Two wire connection with supply over the signal line. 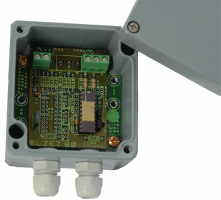 Pt100 RTD input, selectable temperature ranges. In case of special request we provide the board also without box. AD693 is a small analog conditioning circuit to amplify and linearize sensor signals as close as possible to the sensor. The possibly long line to the computer is driven with a relatively insensitive 4..20mA process current proportional to the linearized sensor signal. The circuit derives its power from the current loop (4mA idle current) it controls. One wire is tied to the positive supply (15 to 36V), the other to the ADC input (shunt resistor). The circuit comes in a 8x8 cm waterproof (IP65) housing with two cable feedthroughs PG7. Max. shunt resistances: 100Ohm @ 15V supply, 500Ohm @ 24V.